1. 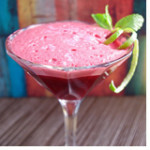 In a mixing glass, combine all ingredients, add ice, shake vigorously and serve up martini glass. Garnish with sprig of mint.